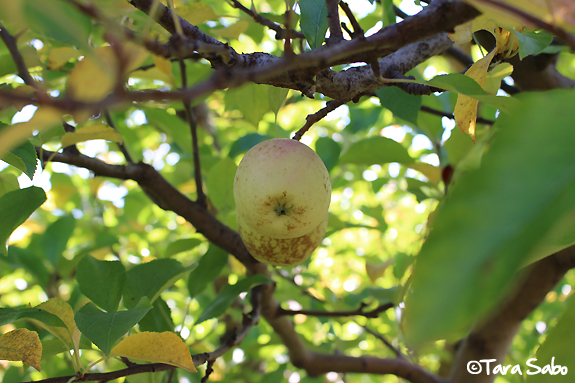 I love picking apples. There's something about being in an orchard that feels so healthy and so far removed from the crazier aspects of life. Plus, I'm of the opinion that the apples taste way better. We went this weekend. I mean, the weather was absolutely perfect. 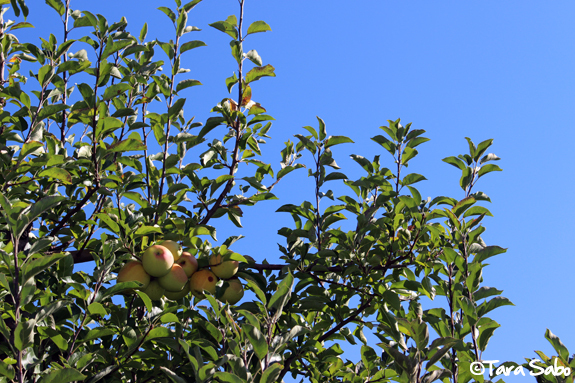 There were a wide variety of apples to pick, but we stuck to Gala and Golden Delicious apples. 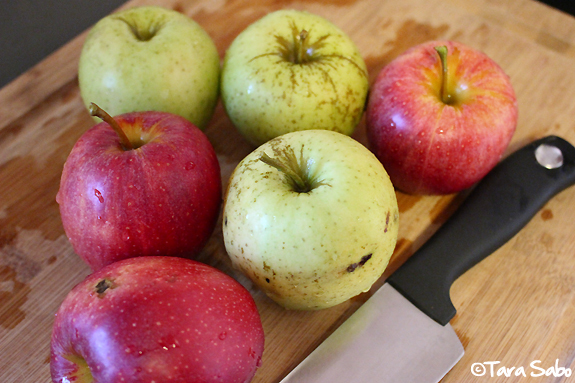 Both of which are tasty and entirely perfect for applesauce. 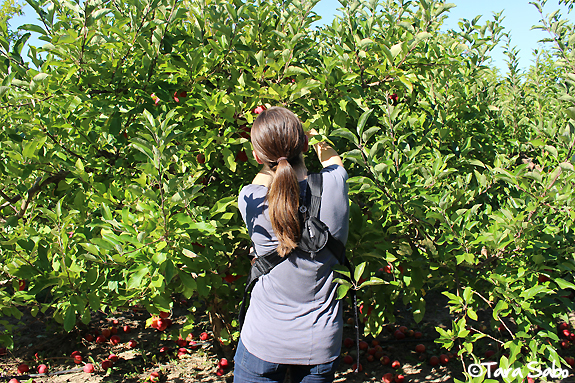 In addition to big and juicy apples, we hunted down some that were smaller that would fit in Hannah's little hands. Girl eats applesauce like it's her job, and is just now figuring out that actual apples are just as good. Evan even got in on the picking action. Well, sort of. He pretty much slept through the entire experience. That carrier puts him right to sleep. Nod to being in the womb, perhaps? 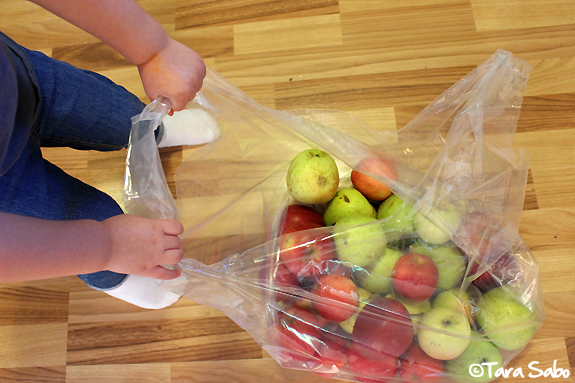 We ended up picking enough for at least two batches of applesauce and plenty of apple snackage. My little helper jumped right in when I asked her to assist with making the first batch of sauce. 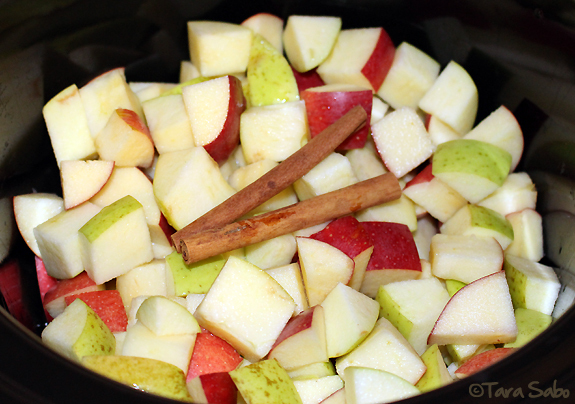 Now, this was going to be my first time cooking applesauce in my crockpot, so I turned to Pinterest for some recipe ideas. The one I pinned seemed simple enough. And it literally took me five minutes to prep. I ended up making two modifications to the original recipe: I left out the sugar and used two cinnamon sticks instead of powdered cinnamon. As you can imagine, the house smelled uh-mayzing while it cooked. And after about three hours, the apples were soft enough to purée in my stand mixer. 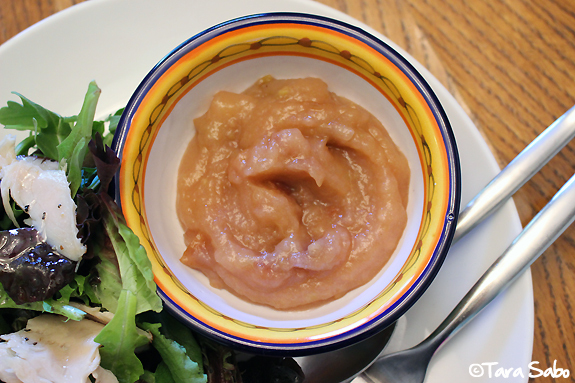 I didn't peel the apples before cooking them, which created a chunkier applesauce. Not a bad thing, but I think next time I will just take the skins off (so that Hannah doesn't have to pick them out, silly girl). 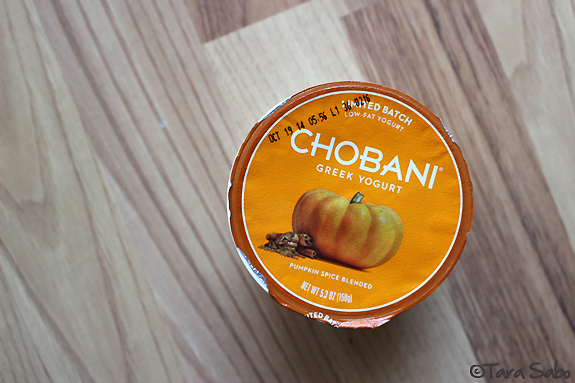 Question: What is your favorite Fall activity or treat? 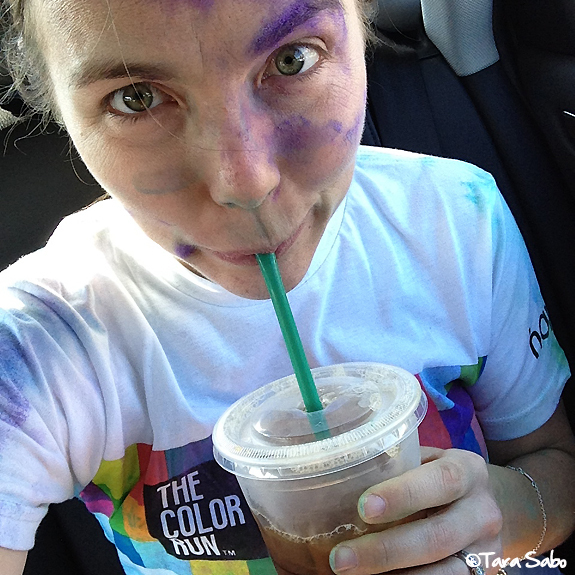 The following post is sponsored by The Color Run. I didn't receive any compensation for my thoughts, but they did provide me with two free race registrations. As always, these opinions are my own and in no way influenced by the company. Running in a race is a lot of fun. Hard work, but fun. And then there's The Color Run. With all forms of competition removed, it takes the fun factor up a notch. 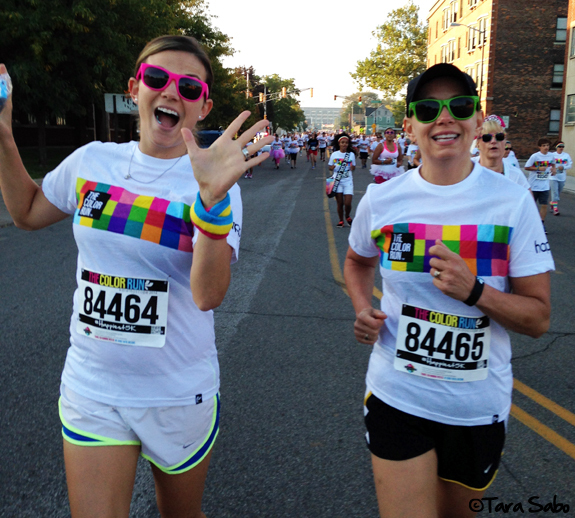 This past weekend, The Color Run came back to South Bend. I ran it with my sister and my mother. We ran it last year, too. 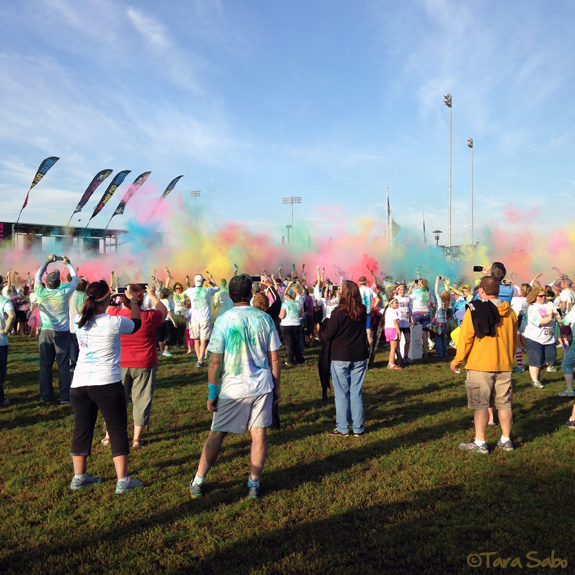 Here's the thing about The Color Run: If you're looking for a race, you'll get annoyed by all the walkers. It's the truth. 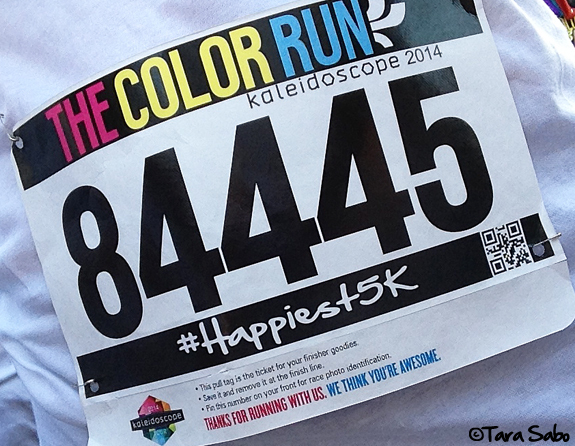 The Color Run is not an event you attend to make 5K records. Remember, the competition is removed. That said, it IS a run, so you can go about it as you see fit. But the sheer number of walkers involved makes it really hard to maintain any form of consistency while running. We had to do a lot of weaving. Part of me thinks that this should be taken into consideration by the event planners—maybe those who want to run it should start first—and part of me is trying to remember that it's not a race. Because seriously, what race do you know of that willingly douses its participants in a mixture of cornstarch and color? We got through Blue pretty easily. There was a bit of a backup in the second color zone, which proved to be a bit annoying. 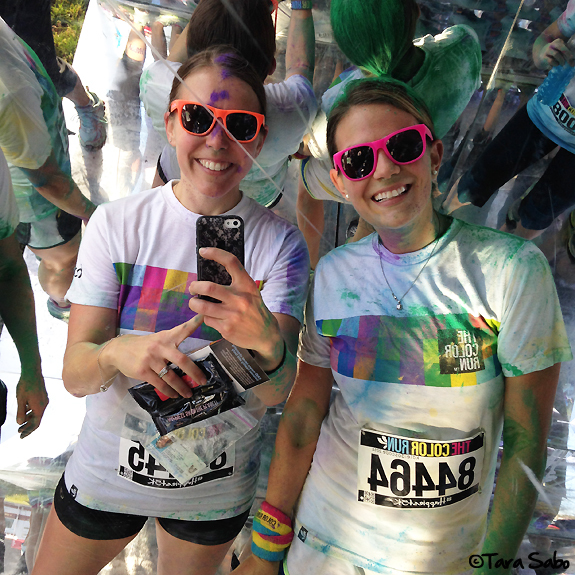 Still, we were pretty colorful by the end of the race. 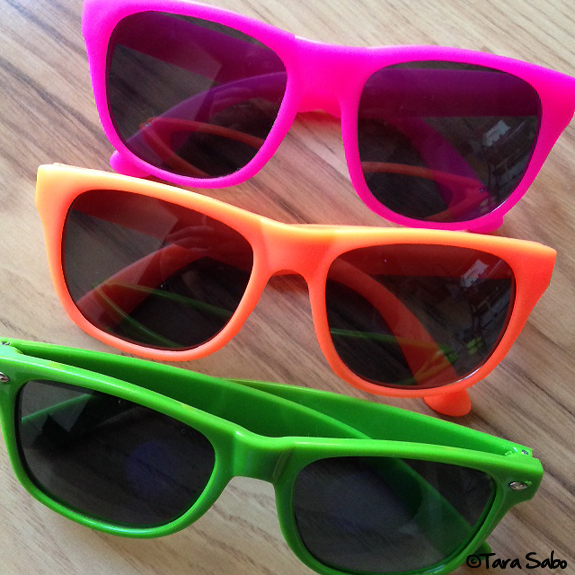 If you've got The Color Run on your schedule, invest in some cheap sunnies. We didn't run with them last year, but the eye coverage was nice. For the most part. I still somehow managed to get a face full of purple. 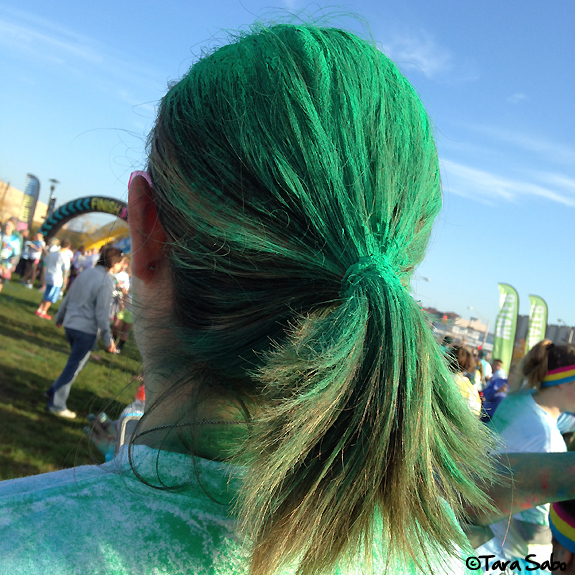 Seriously, the green guy dumped an entire bottle on my sister's head. She definitely won the prize for collecting the most color. In our group, at least. 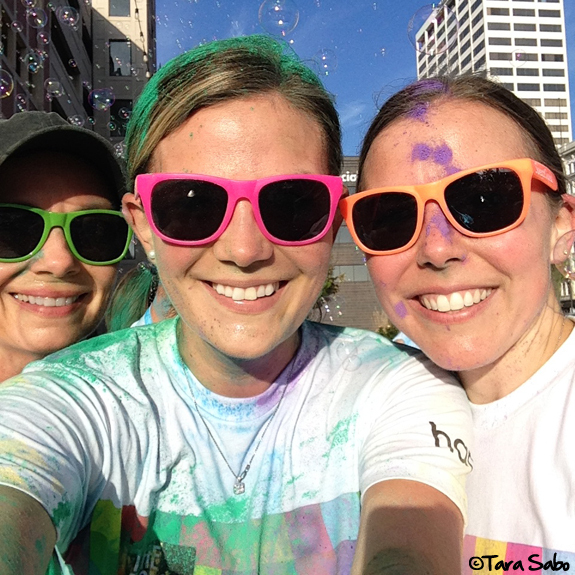 When all is said and done, I think my favorite part of The Color Run is the post-race color throw. It's just so cool to see all that color flying up in the air. If you are considering The Color Run, I say do it. But be prepared to have fun. Set all running goals aside and just go with the flow. Because if you go into it with a true 5K mentality, you'll get frustrated. Or, make sure you're at the front or back of the pack to avoid the bulk of the participants. My thoughts on The Color Run in South Bend, specifically (in case any of the event planners are reading this): Why did we have to stop at all the stoplights? Were only some of the streets blocked off? Also, that path along the river...super not at all runner friendly. It was more like a bottleneck of people moving along. Post run coffee stop, obviously. Mom and I ran five miles before The Color Run because that's what our training plans for The Grand Rapids Marathon Relay called for. This had me up with the stars to get down to South Bend in time. 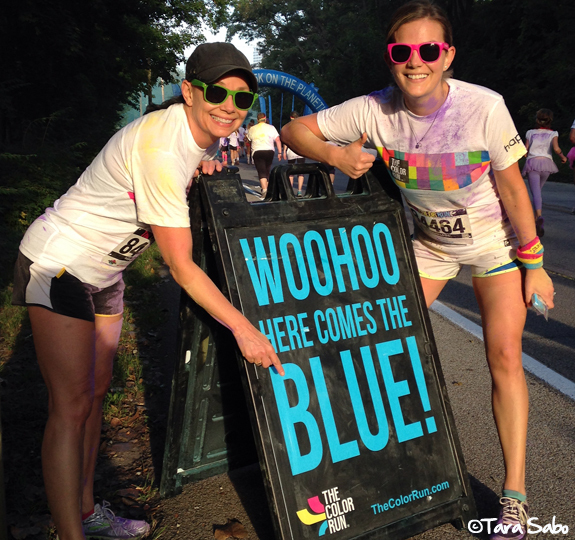 Question: Ever do The Color Run? What are your thoughts? If you're a runner, how do you approach events like this? Make it fun, or make it a decent run? The following post is sponsored by Sweat Pink on behalf of Lorna Jane. I didn't receive any compensation for my thoughts, but I will be getting a Lorna Jane bracelet in exchange. As always, my thoughts are my own. Ever shop at a Lorna Jane store? They're few and far in between over here in the States. I have but one pair of Lorna Jane running shorts. Super comfy, great fit. Absolutely adorable, as is most of their fitgear. But that's not the point of this post. Let's talk about Active Nation Day. It's a movement that Lorna Jane started a few years ago, and it went global this year. 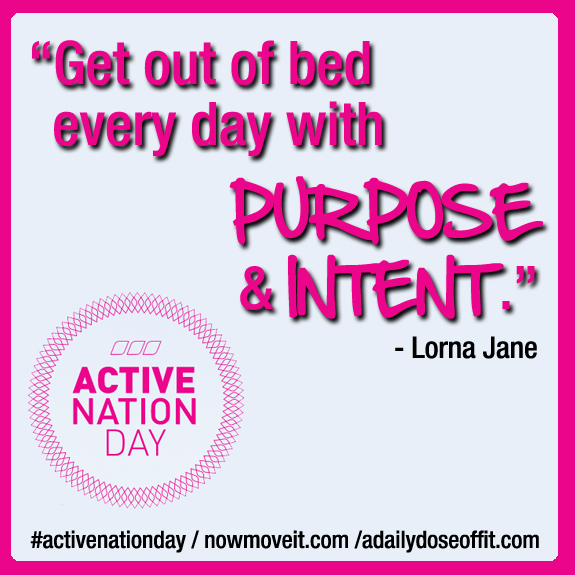 Today, in fact, is Active Nation Day. If you're lucky enough to live near a Lorna Jane store, you might have been able to attend a special event aimed at inspiring you and others to live an authentic and active life. But really, Lorna Jane is the type of brand that goes above and beyond their storefronts. Sure, their clothing is adorable. But it's the lifestyle they promote and how they do it that really impacts their audience. I love the concept of Active Nation Day. Let's be honest: I love the concept of living an active life. To live an active life is not to get up every day and crank out miles or lift heavy weights. These things count, but are only part of the story. For example, you can "get out of bed every day with purpose and intent" because waking up on the right side of the bed is always a good thing. 1) Gravitate toward that which is good for you, like fruits and veggies. Or maybe hours of gut-wrenching laughter with friends. 2) Take the road less traveled...on foot or bike, if at all possible. 3) Choose to be proactive. Especially when it comes to your health. 4) Discover that which ignites your innermost desire to move through each day, be it faith, fitness, family or friends. Or all of the above. 5) Believe in your very own power to, quite simply, be a part of this world we live in. 6) Accept every aspect of your life, and adjust accordingly as necessary. I mean, you really just have to look in the mirror and say, "hello, life...let's do this" and then go out and do it. Easier said that done? Sometimes. But that's what makes life so great. There's just so much to say, do and experience. Question: What are some things that you do to live an active life? And here we are, at Friday! Anyone else pretty excited about that? I feel like I've had a crazy week. We had a member picnic at the gym on Tuesday night, I subbed a Functional Training class on Thursday night...add to it all of my normal weekly duties at the gym and around the house, plus all the miles I've been running...don't get me wrong, I'm not complaining. I'm just excited that it's Friday. So we'll keep it easy today. Or maybe I'll set you up for some good picture-taking this weekend because I'm pretty much obsessed with all of the picture apps on my iPhone. It's no secret that I'm head over heels for Instagram, and my favorite photo apps make that social platform even more fun. Or maybe it's just my Studio Art minor self getting into the artsy fartsy side of it all. You'll have to investigate the following if you don't use an iPhone. Admittedly, I don't really know what phones work with what apps. Sorry 'bout that. Also, I'm not a professional photographer. I just like to play with pretty pictures and fun camera functions. I take most of my pictures with the camera on my phone, and then I import them into Camera+ to fine tune things like sharpness and exposure. There's some pretty cool filters in this app, too. I don't always use them, but they're there if/when I want them. I just started playing with Union, and I think it's pretty sweet if you have the right photos. It basically layers two or more photos on top of each other, and you can play with opaqueness to determine how much of what is shown. Look back up to my FitSnap example. I used Union to put my legs on top of the street. I don't piece together a lot of collages for Instagram, but when I do, I always turn to InstaCollage. It's just really easy to use and has a lot of great predetermined frames to fill in. I haven't used either of these two very much, mostly because I haven't had much time to sit and play, but from what I can tell, they're both awesome. 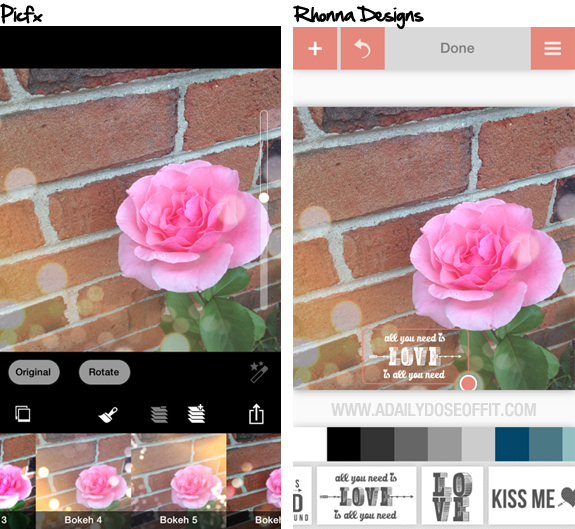 PicLab takes Camera+ and combines it with ABM and Rhonna, for lack of better description. Tons of features to enhance your pics. And Snapseed is more along the lines of Camera+ in that it gives you a variety of ways to fine tune your iPhone photos. Most of the apps above offer in-app purchases, but I have yet to make any. They all seem to function quite nicely with the tools that come with. Now, I paid for Camera+, ABM and Rhonna. The rest were free. And for what it's worth, I hate paying for apps (so that tells you something). 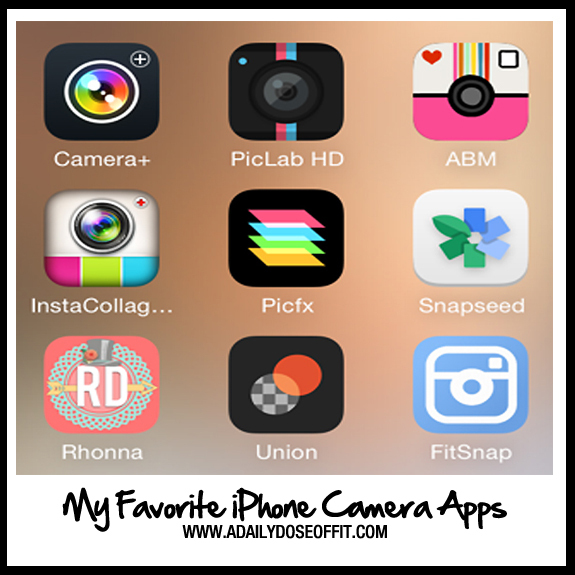 Question: What camera apps do you use on your phone? Some of the links in today's roundup are a bit older than, well...a September date, but when an article is good, it's worth sharing no matter when it was written. Behold, this month's Feedly Finds. And as a bonus, a few links that I found elsewhere while surfing the Internet. Bedtime reading, perhaps? 1) I really love my kids, and my work situation is fairly ideal. But dang, I'm not immune to bad days. It can be really hard to overcome them, amiright? That's why I'm loving these simple tips for moms to turn a bad day around. 2) You're beautiful. I'm beautiful. We're all beautiful in our own way. Behold, these celebrity quotes about beauty. They're all good. 3) Life moves fast, doesn't it? So fast that we often forget to stop and embrace it. We focus so much on the be all, end all that we forget about all the little moments in between that make us who we are. That give us experiences. Because those are the moments that define our journey from one thing to the next. Remember to embrace your unique journey. 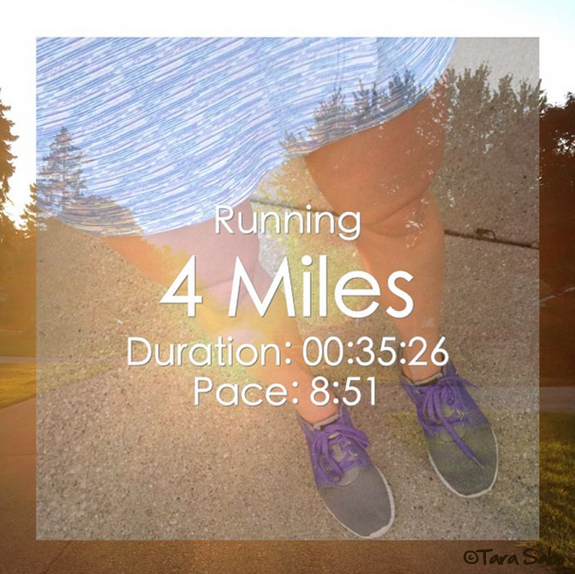 4) I'm really good about adding milage to my weekly runs. But I have yet to take the next step: Speedwork. I want to start doing it but I have no clue where to begin or how to incorporate it. This post is going to help me. 5) I'm obsessed with Instagram. It's totally my favorite social platform, and I've been spending a lot of time engaging with my audience and the people I follow. But, ya know...do I have to follow everyone back? What's the etiquette there? Am I a bad Instagrammer if I don't #followforfollow? 6) Raising a toddler is no joke. My daughter is 2.5 going on 25, I swear. I can't tell you how many times I've heard HER say "because I said 'yes'." I mean, what? Needless to say, I'm studying these strategies for negotiating with a toddler. 7) One of the things I stress to clients new and old is the need for consistency. This post explains why it's so important and what you can do to achieve it. 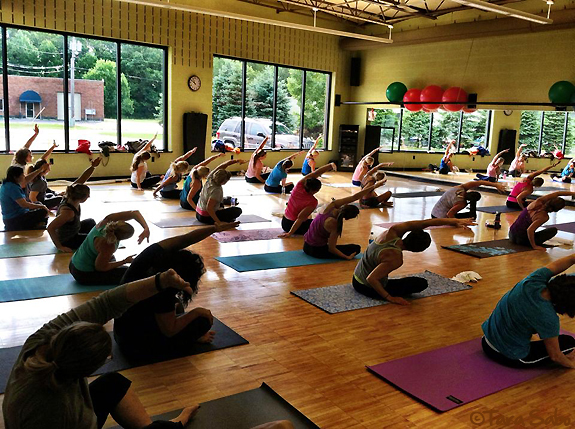 8) I love Yoga, but I don't always enjoy Yoga classes. I think maybe I just haven't found the right one. According to this post, I should be taking Vinyasa classes. This is ironic, of course, because it's one of our most popular classes at the gym. I'd take it if I didn't have a client at the same time. Clearly I need to clone myself. 9) It's kind of a bad thing that I had a boy because now I have yet another section to shop in the clothing stores. Seriously coveting everything in this post for my little man. 10) I was recently asked to consider joining a Tough Mudder team. The race would be next Spring and I'm seriously considering it. Mud run = Bucket list item. But the Tough Mudder...I don't know. That sh*t looks crayzay! I'll pocket these mud race tips, just in case. 2) One of my closest friends from college e-mailed our group of besties a list of 10 rules for brilliant women. And I think they should be required reading for every woman of this world. 3) It's been well over a year since I've taken my position as the fitness director. It's not something I ever anticipated doing when I decided to pursue fitness, but here I am. A manager. If you're a fitness professional, perhaps this is a step you might take one day. ACE Fitness can help you understand when you might be ready. 4) I've been doing a lot of research on sugar these days, basically reading anything I can about the white stuff because, seriously...I have an entire mouth full of sweet teeth. 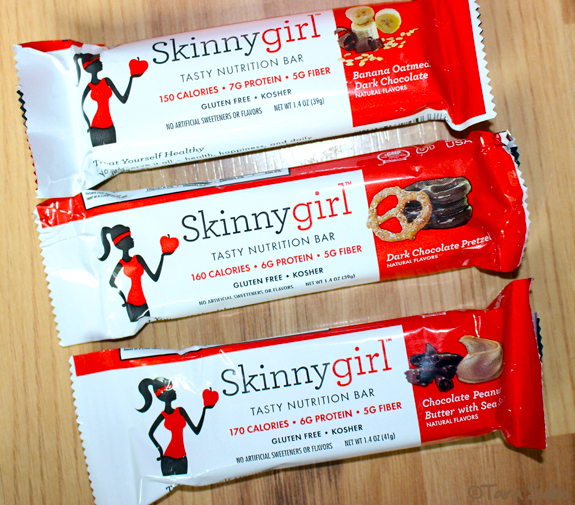 What I'm finding: Sugar is the new fat. 5) Instagram is my favorite social platform right now (see above), I've been doing what I can to make my feed engaging and interesting without offending my followers. Just recently, JustUnfollow posted an article on their blog outlining the rights and wrongs of Instagram use. It's quite interesting. Question: Have you participated in a mud run? Have you done the Tough Mudder? Thoughts? I ran eight miles this weekend. According to MapMyRun on my iPhone, I only ran seven. It's my fault. Pretty sure I shut off the app at my turnaround point when I checked my stats. Big fat ugh. Currently waiting for the Amazon fairy to deliver my new Garmin. Anyway. Tech issues and indoor runs aside, training for the Metro Health Grand Rapids Marathon Relay is going well. There are three people on my team and I'll be running the second leg, which makes me responsible for eleven miles and some change. I added a virtual half marathon compliments of Jost Running. I've really enjoyed working with them. If you've yet to experience a virtual race, you might consider it. For example, I couldn't find a half marathon that worked with my running and personal schedule, so going virtual will allow me to fit one in as I see, well...fit. Should be fun. Still not sure how I'm going to balance it with my scheduled long run, but...should be fun. 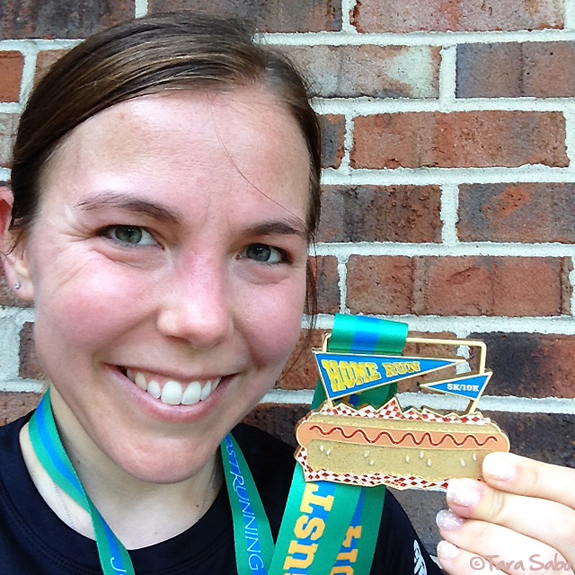 Question: Have you ever done a marathon relay? Any tips for navigating the exchanges? So you started a blog. You even wrote a few awesome post—now what? How do you, like, BE a blogger? It's kind of intimidating, right? Or maybe just confusing? But also exciting and fun. You read blogs all the time. You know some of them are huge. And maybe some of them aren't. Could you be like them? Could your blog take you places? Get you freebies? Make you money? Better yet, could it introduce you to amazing people in real life or maybe just via the Internet and social media? Yes, yes it can. It can do all of that and more on a small, medium or large scale. It can also make your head spin (even when you think you've got the whole blogging thing down). When I started A Daily Dose of Fit, I really had no clue what I was doing. I was a writer who wanted to write, so I wrote. Some posts where better than others, sure. Some probably never garnered much of an audience. But that didn't bother me because it was fun. It still is fun. But I've learned a lot since then. Am I a big, huge blogger with millions of readers? No. Do I know everything there is to know about blogging? No. Am I still learning? Yes. 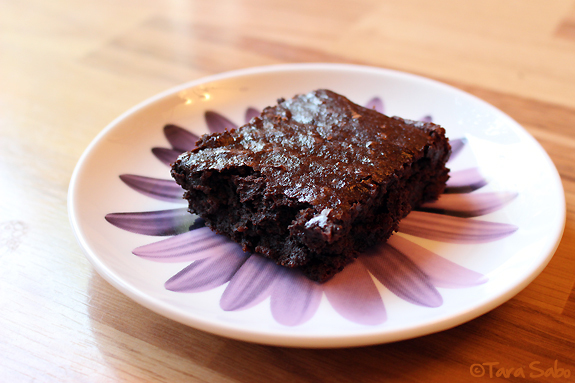 So today, I'm venturing away from fitness and health for a quick post about blogging. (I know, crazytime.) Because even though I'm still learning, I've definitely learned some things along the way that I wish I had known before. See, there are a number of forums I participate in where people ask for help. And I feel like newer bloggers are always asking the same questions. There is absolutely nothing wrong with this, but I'm always giving (and seeing) the same answers. So I thought, well...maybe I could corral some of my two cents into one post for those of you that are interested. 1) Write from the heart, always and forever. Because when you write from the heart, you exhibit your true self. As with anything, you'll feel the pressure to blog a certain way or about a certain thing—rise above that. Just do what feels right and natural. Keep it real and tell YOUR story, not someone else's. And if you feel like going off topic (like writing a post about blogging when you typically write about fitness), just do it (from the heart). 2) Dive into the social media platforms that interest you and interact with the users that share your interests and/or interest you in some way. Sure, brands love accounts with a high number of followers, but they also love to see engagement. If you follow and/or like people just to get them to follow and/or like you back, well...that's an approach that feels spammy and disingenuous. And it usually fails to work. Especially if you unfollow/dislike people AFTER they follow/like you. Bonus tip: If you intend to grow yourself as a brand, create social media platforms that express your brand. Using private Instagram accounts for a public blog, for example, just doesn't work. Solution? Create two accounts. And if you're on Twitter or Facebook, use a service that automatically pushes your new posts to the platform. 3) Don't hesitate to reach out to brands that you want to work with. Craft an e-mail that explains what you can offer and why you want to work with them, then make an ask. It doesn't matter how big or small you (or they) are. If you're polished and professional, they just might bite. What's the worst that could happen? You know the answer. 4) Join the community. Social media accounts aside, there are a number of different blogging communities that are worth participating in. If you're a fitness blogger, you obviously know about SweatPink and FitFluential. But those aren't the only two. And for those of you that aren't fit based, consider The SITS Girls and POPSUGAR Select. This, of course, takes social media engagement to another level. They're like extracurricular activities, really, and they can open doors to new opportunities. Bonus tip: The doors to these clubs aren't always wide open for entry. If you apply and get turned down, return the focus to your blog then apply again later. 5) Lower your expectations. And then create expectations that make sense for you, your life and your availability—because we can't all be full-time bloggers, nor do we all want to be. So if your goal is to post three times a week and you do just that. Hooray! Walk away from that feeling successful. Additionally, you might consider building a blog calendar, rather than going at it randomly from one day to the next. This not only helps you meet the expectations you've set forth, it also keeps your sanity in check. Bonus tip: I mean, I could go on forever. Just know that the Internet is saturated with blogs. To get noticed, you have to be original. You have to be genuine and true, and professional and polished, too. Don't lose yourself in the race to be the best, because there really is no such thing. Just be you, because you know what they say (whomever "they" is): No one does it better. 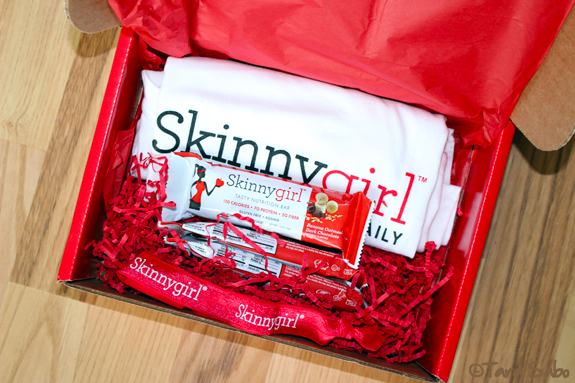 • "The Key to Successful Blogging (and how it translates to life itself)"
• "Easy Ways to Improve Your Blog"
• "Easy Ways to Improve Your Fitness Blog"
• "6 Writing Tips for Bloggers"
PSS: Don't forget to enter my Skinnygirl Tasty Nutrition Bar giveaway. Question: Seasoned bloggers, what tips can you add to this post for any newbies that might be reading? Mile three, right? What the?! I bet you can guess where this is going: Yes, I totally lost track of the choreography somewhere in my third mile. It threw me off. Big time. Thing is, I totally didn't even notice myself slowing down! But I did get pretty down on myself for not getting the right counts, and I started playing with my iPhone, repeating the music and whatnot to get it right. All while running. And then I figured out where I messed up. And apparently that made me run faster. Just goes to show that what you think about while you're running can affect your pace. 1) Be aware of negative thoughts. Clearly they slow you down—in all aspects of your life, not just while you're running. 2) Plan ahead. If you know there's something you need to ponder, save it for while you're running in an effort to fight the boredom (which might set your feet free). 3) Tune into someone else's thoughts: I recently started listening to podcasts, which makes it feel like I'm running with a friend. 4) Make sure your playlist is jamming (if you run with music). Boring music or music that's just too slow will, obviously, kill your motivation and your speed. 5) Run free. This might seem like a contradiction to the whole "plan ahead" concept, but sometimes you just have to let go of everything and run. 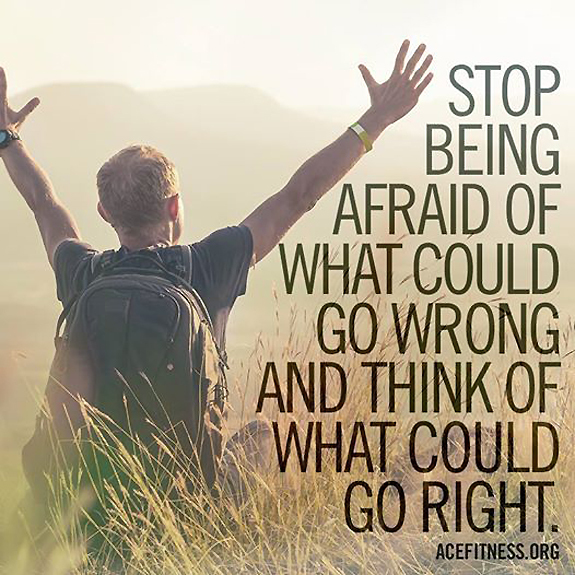 Sometimes you have to make a conscious effort to set your feet free, and concentrating on one foot in front of the other can block out all of the thoughts that might be distracting you. Question: What do you do with your brain while you run? This post contains a race recap, the entry for which was given to me by Jost Running in order to facilitate a review. I received no other compensation, and all thoughts and opinions are my own (of course). I'm so off on the workouts this week. My girlie got sick last night, which foiled my plans to run four miles. And then it stormed tonight, so there goes another opportunity. BUT...I'm redeeming myself tomorrow. Our car is at the shop, ready to be picked up. The shop is four miles away, and if I hit a few side roads, I can turn that four miles into six. Bet you can guess where the uphill was. I'm pretty happy with how this ended. It felt fast, I felt strong...according to the leaderboard, I finished at the top with a total time of 58:23. I don't really have a scientific approach to training. I just go out there and run, paying attention to how I feel, making an attempt to push myself a bit more every single time. The more I read Runner's World, Run Like a Mother, and all the blogs written by more seasoned runners, I feel like I should go at it with fartleks and track workouts and whatnot. Until then, I'll stick with what I'm doing because I like what I'm doing. Up next on my race calendar is The Color Run in South Bend. As I work my way toward my goal for Grand Rapids, I'm contemplating signing up for a virtual half marathon. We'll see. 1) You can run a virtual race wherever and whenever. You aren't confined to Saturday and Sunday mornings, which can turn your weekday runs into something a little more fun. 2) Most virtual races give great medal. Especially if you sign up for a Jost Running race. 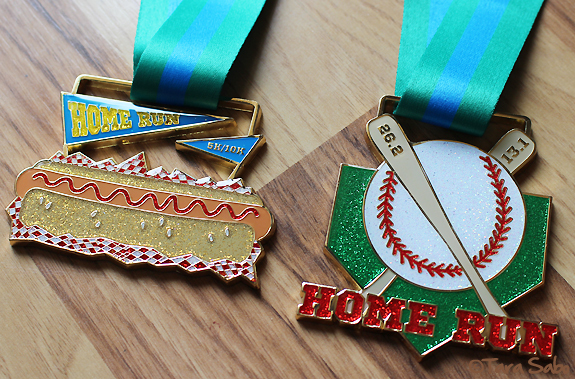 I mean, who doesn't love a good race medal? And if you like race swag, some even do that, too. 3) Virtual races almost always support a charity, and putting one foot in front of the other to help someone else is totally cool. 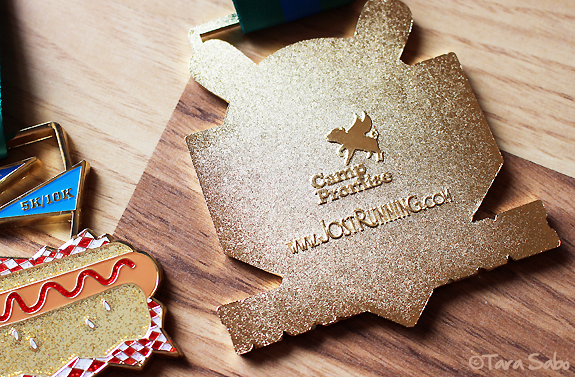 Jost Running chooses a different charity each month, the logo of which is engraved on the back of that month's medals. 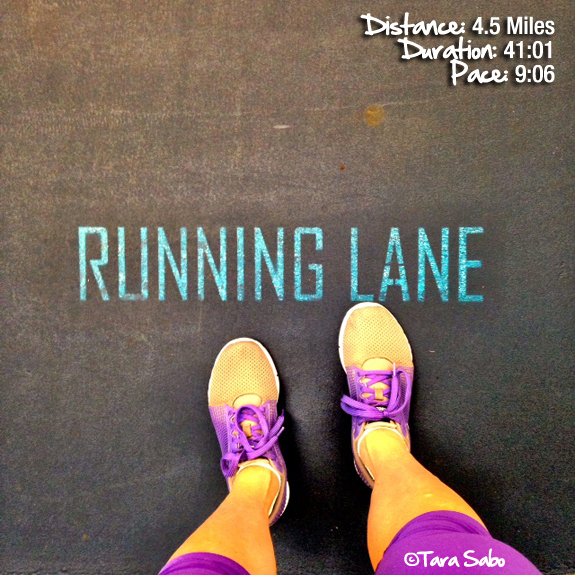 4) Virtual races are usually a bit cheaper than your standard in-person race. So if competition is your thing, you can do it more frequently without breaking your bank. 5) There aren't any cut-off times. You can take as long as you want, even days, to run that 5K or marathon. And you can still walk away with the prize. And the pride. Which means that anyone, literally anyone can participate in a virtual race. 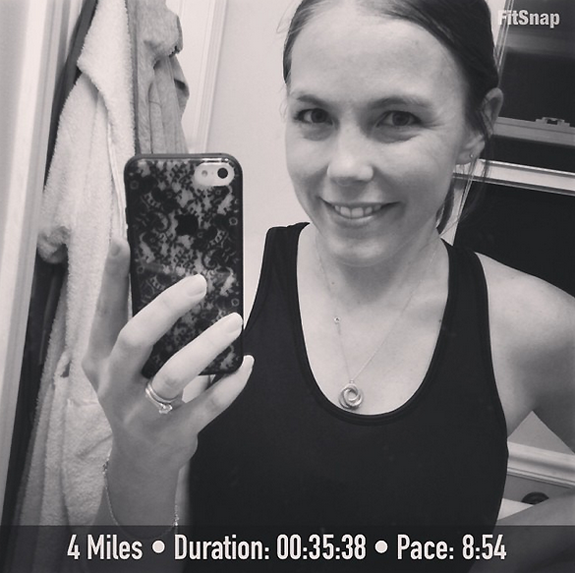 Question: Have you ever participated in a virtual race? 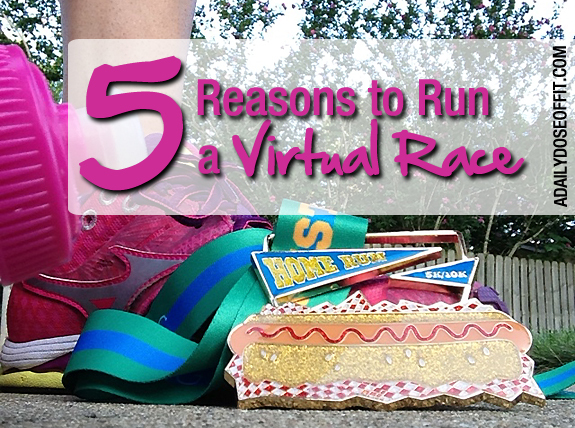 Can you add to this list of reasons why someone should run a virtual race? See it over there in my sidebar? That new badge? PiYo instructor. That's me. I did it. And I've been working so hard to learn the choreography because PiYo Live is one of those classes. It's timed out to the very last second, which means I have 3,600 seconds to memorize (because that's how many seconds are in a 60-minute class). Realistically, it's not that hard to learn the choreography. But my nerves are killing me. I feel like I'm in speech class all over again. Which is silly because this isn't my first group fitness class. I've been teaching for four years. (What?!) But this is the first time I will be responsible for actual, can't-mess-up-or-wing-it choreography. Translation: This is the first time I won't be able to rely on a class outline or other form of in-front-of-me notes. So all I can think about is what will go wrong next Friday. What happens if I forget what comes next? What happens if I lose count? What happens if I forget to cue a modification? I mean, total disaster will strike. Maybe I just need to teach my first class. That's what I tell all of my new instructors: That they just need to teach their first class. Because everything will be OK. It will be OK, right? Class will pass just fine? ...to bring this new format to my club. ...to stand in front of a class again in a studio that feels like home. ...to help people increase their strength and flexibility. ...to see people smile when they realize how good it feels. So much can (and probably) will go right next week. So what if I mess up. Our members are awesome and I think they'll understand. They've understood before, so why not this time? I've messed up before and they keep coming back to my classes. Fitness isn't black and white, it's not be-all and end-all...it's everything. It's getting together and moving. It's following a format and leaving room for mistakes, changes, updates, whatevers. I can, and I will teach this class. I can, and I will believe in myself. Because why take myself down before class even starts. Don't ever let anyone, anything or any situation convince you otherwise. Question: Did you ever have to take a speech class? Did you like it? Why or why not? Man, that holiday weekend threw me off! Anyone else forget that it's Tuesday and not Monday? I should have known because I taught my first post-baby Spinning class today. And I always teach Spinning on Tuesday. Rolls eyes and gets with the program. Let's recap August, then go over some goals for September. Shall we? We've definitely been getting outside, although there have been days where it's just been too hot. Not for us, but for the kiddos. Sadly, we only went to the beach twice this month. And, well...twice all summer. But our little kiddie pool has seen its fair share of action. I'm so in love with this program. I plan to write a recap of the certification process and what it's like to teach a PiYo Live class as soon as I actually teach one. We launch it at the gym next week. I'm nervous...and really, really excited. Yes! Done! And as I said before, I taught my first post-baby class today. I took a class about a week ago, and it was the first time I had been on a bike in almost four months. I felt a little rusty in the lead bike this morning, but you always have to get that first class over with and then, well...it literally is like riding a bike. You just do it and it feels right. Fail. Sigh. And I do love me a good photo-a-day challenge. Oh well. I went back last week to a pretty empty schedule, which gave me ample time to catch up. My schedule is still pretty light, which is great. I don't feel overwhelmed. I'm not sad about being back. It helps that I like my job, sure, and that my kids are down the hall in the nursery. But still. I was ready. I'm a new fan of virtual racing. Expect a race recap this week. 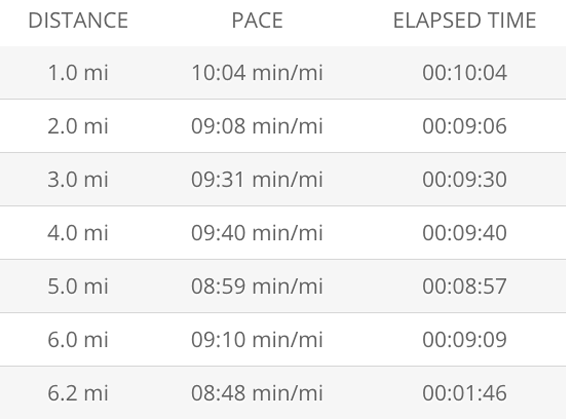 My training plan calls for another 6-miler this weekend, and I'm wondering if I can top what I did this past weekend. This is it. The transition month. It still feels like Summer up here in Michigan, but it won't last forever. And I hear rumblings of a tough Winter yet again this year. So who knows what these next few weeks will be like. We're all just riding the heat for right now, hoping it sticks for a little bit longer. 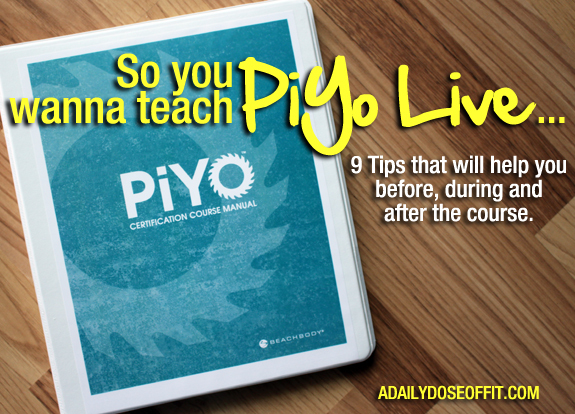 1) Teach my first PiYo Live class without messing up too badly. 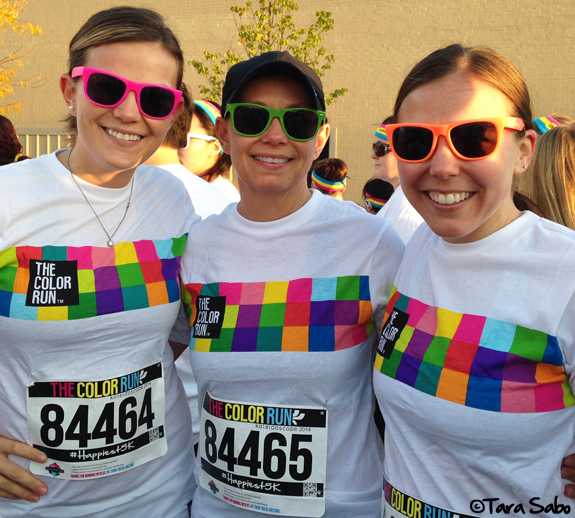 2) Have fun at The Color Run in South Bend on September 27. 3) Sign up for the Hot Chocolate 15K in Chicago on November 2. 4) Reduce the amount of sugar in my diet. 5) Friggen' buy new running shoes already, gah! 6) Figure out a team uniform for the Grand Rapids Marathon relay. Question: Have you ever taken a PiYo Live class? What did you like/dislike about it?